Classic theatre renovation is a passion of Tiffin Scenic Studios. Throughout the years we have successfully created modern, flexible performance spaces in historic structures while maintaining the character of the original design. The renovation process begins after analyzing the nature and condition of existing equipment and draperies. We then make recommendations based upon intended use for that facility. 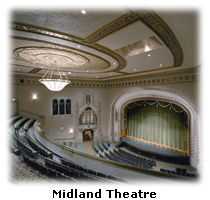 Our work with historical societies has enabled us to restore the past while also incorporating modern safe theatrical rigging systems for many classic theatres throughout the country.